The cause is unknown. Family history of Dupuytren’s contracture makes you more likely to develop this condition. It does not seem to be caused by occupation or from trauma. The condition becomes more common after the age of 40. Men are affected more often than women. Risk factors are alcoholism, diabetes, and smoking. A small, painless nodule or lump develops in the tissue below the skin on the palm side of the hand. Over time, it thickens into a cord-like band. It becomes difficult to extend or straighten the fingers. In severe cases, straightening them is impossible. The orthopaedic specialist will examine your hands. The physical examination of the palm will show thickened scar tissue and difficulty straightening the fingers. Exercises, warm water baths, or splints may be helpful. A newer treatment involves injecting a substance called collagenase into the scarred or fibrous tissue. Three injections are needed. You may have side effects such as swelling, pain, and itching. A more rare but severe side effect is rupture of the tendon. The disorder progresses at an unpredictable rate. 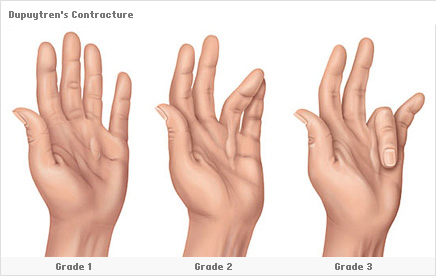 Surgical treatment can usually restore normal movement to the fingers. The disease can recur following surgery in up to half of cases within 10 years. There is a risk of injury to blood vessels and nerves during surgery. Call Dr Kevin Yip (+65 9724 1219) if you have symptoms of this disorder. Can you provide me the name and contact for a doctor or clinic that does Collagenase Injection (Xiaflex)treatment. Our clinic does not provide Collagenase Injection (Xiaflex)treatment. I have bilateral Dupuytrens. Can both hands be treated by collagenase herapy at the same time? Can you give me a Doctor`s name to contact re treatment please.